The Handbook of Speech Production provides a state-of-the-art survey of the interdisciplinary field of speech production. Twenty-four chapters from leading international researchers, representing abroad range of academic backgrounds including otolaryngology, information sciences, and linguistics, cover key areas of research in this burgeoning area of study. 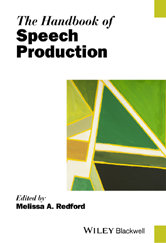 The contributions bring together behavioral, clinical, computational, developmental, and neuropsychological perspectives on speech production with an emphasis on kinematics, control, and planning in production.